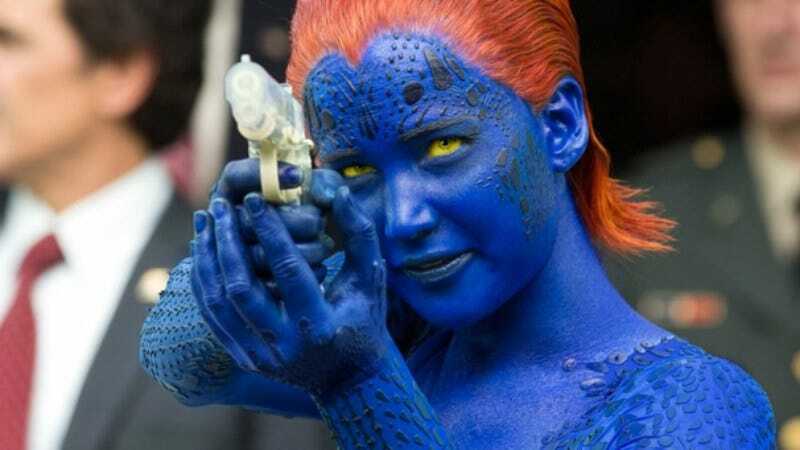 The character of Mystique, a shapeshifting mutant with a grudge against Charles Xavier in the X-Men movies, has been more than ably portrayed by Jennifer Lawrence since 2011’s X-Men: First Class. But now it looks like the next installment, X-Men: Apocalypse, will be Lawrence’s last; MTV News reports that the actress will no longer be appearing in the films after her third appearance as the blue mutant. Lawrence doesn’t give a reason for why she’s not continuing on with the enormously successful franchise. However, may have something to do with the eight-hour process it took for her to get into costume, even if that number dropped to three for the last film, X-Men: Days Of Future Past. Additionally, the casting of new names to play already-established roles means that the franchise is planning to have new actors take on these characters. Which makes sense, if the studio wants the series to last beyond the lifespan of Hugh Jackman, not to mention the size of the Brinks truck they would have to back up to pay for all the salaries of the many big-name actors they’ve been using. X-Men: Apocalypse, starring the final mutant outing for Lawrence and likely some other cast members as well, comes out May 27 of next year. The following X-Men movie, presumably starring the films’ former craft service coordinators, is not yet scheduled.